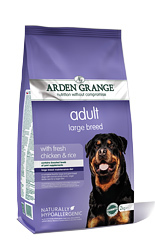 Arden Grange Large Breed dog food with fresh chicken and rice has been specially formulated to meet the nutritional needs of large breed dogs with a larger kibble size and increased levels of Glucosamine Chondroitin and MSM. The Arden Grange large breed formulation helps to maintain supple strong joints and cartilage so important in large and giant breeds. 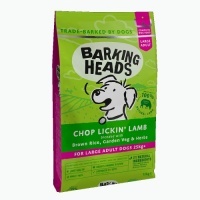 Big Dog World recommends Arden Grange dog food and our own dogs love the taste. The complete balanced nutrition keeps their skin, coat and joints in great condition and we are happy to recommend their dog foods. Arden Grange Large Breed Ingredients:Chicken; (chicken meat meal 25%; fresh chicken 5%); rice 25%; maize; refined chicken oil; beet pulp; chicken digest; whole dried egg; yeast; krill; whole linseed; minerals; glucosamine (740mg/kg); MSM (740mg/kg); prebiotic FOS; prebiotic MOS; chondroitin (520mg/kg); yucca extract; cranberries; nucleotides.